All pet owners would agree - pets are family. And you want to make sure your family is always comfortable in your own home. But how do you know if your pet is comfortable? Have you ever thought about the way house temperature affects your pets, and what temperature is best? If so, read on to learn about the best house temperature for pets. Want to know the best house temperature for pets? Read below how to keep your furry friends cozy! You do everything for your pet to take care of them: feed them, walk them, bathe them, and play with them. Your pets can’t tell you what they want or need, so it is up to you to figure it out. One things that most pet owners don’t think about is how the temperature in your house can affect the health of your pets. Do you know the perfect temperature for your pets? To start, it is important to note that there isn’t one perfect temperature setting for all pets in all seasons. Each pet will require different temperatures to be comfortable. The best temperature for your pet depends on many factors, including breed, health conditions, and many other circumstances. Dogs and cats with thick, long coats tend to be more cold-tolerant, and often overheat quickly. Dogs and cats with thin, short coats are not able to retain body heat as well, and therefore prefer warmer temperatures. The smaller the animal, the higher surface area to volume ratio. This means that the smaller the pet, the more skin is opposed in terms of their size, and the faster they get cold. Smaller pets struggle to maintain heat, while larger pets maintain heat better but can overheat very quickly. The bigger the dog and cat, the hotter they will get. Big dogs and cats have a higher body fat percentage than smaller dogs and cats. This means that for big pets, they get hot easily, but maintain warmth in the cold. Small pets, on the other hand, get cold easily, and are able to stay cooler in high temperatures. Young puppies and kittens, as well as elderly dogs and cats, struggle to maintain their body temperatures. This means that young and old pets usually require warmer house temperatures. Temperature preference also depends on the specific breed. Two dogs of the same size but of different breeds might prefer entirely different temperatures. Physical and genetic traits play a vital role in temperature balance and regulation. For example, a breed of dogs that have a double coat of fur get much warmer than a slick coated dog. Now that you know what affects the ideal temperature for pets, you are probably asking, what is the ideal temperature for pets? 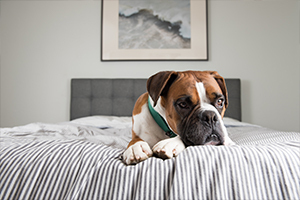 The best house temperature for pets in the summer is between 69o and 72o F. Never leave the thermostat higher than 80o F.
In the winter, plan to set the thermostat between 69o and 72o F. The larger the animal, the cooler the temperature can be. Never set the temperature below 60o F. Always provide your pet with a soft, warm bed and open the curtains so the sun shines in and gives your pet a place to sunbathe. So you know the ideal temperatures now. How do you maintain those temperatures in your home? Follow the tips below! This is the best way to make sure your temperature is in the correct range for your pets. Not even for a minute – on a warm day, temperatures inside a vehicle can rapidly rise to dangerous levels for humans, let alone for pets. No matter what time of day, never leave a pet in a parked car. Signs of a heat stroke include heavy panting, glazed eyes, rapid heartbeat, difficulty breathing, excessive thirst, lethargy, fever, dizziness, lack of coordination, profuse salivation, vomiting, a deep red or purple tongue, seizure and unconsciousness. Animals are at a higher risk of heat strokes if they are very young or old. If you see any symptoms, call your vet immediately. What are other ways you take care of your pet? Share with us on Facebook!